And finally the renewable energy potential of Argentina, led by the wind-swept plains of Patagonia — the world’s windiest place, according to turbine manufacturer Vestas. Here’s a summary of where Argentina’s at right now, politically and economically. If you haven’t followed Argentina’s recent politics, businessman Mauricio Macri won the December 2015 presidential election and announced the country’s decision to re-integrate itself with the global economy following more than a decade of protectionist policies by Cristina Fernandez de Kirchner and her predecessor and late husband Nestor Kirchner. Macri started off his presidency taking some tough decisions, removing a host of subsidies that propped up the incomes of poorer Argentines under Fernandez. Some wealthier Argentines benefited from the subsidies too, and have been no less vocal in expressing their disillusionment. The payback for voters was a pledge to open the floodgates to investment to unlock vast natural resources and create new jobs. Fernandez’s last years in office were marked by a gradual erosion among her core constituency of poor voters. The key issue right now is: despite having received tens of billions of dollars of investment pledges from a host of major companies including Coca-Cola Inc, Dow Chemical Inc. and Royal Dutch Shell, the trickle-down effect to ordinary Argentines is not coming fast enough for Macri, who faces the prospect of the reemergence of Fernandez as a senator in the mid term elections this October. Seemingly unaware of this very high level conference taking place at the Four Seasons Hotel on the the main 9 de Julio avenue (that of BA’s beacon obelisk fame), hooded protestors armed with crowbars blocked traffic and stood off with police in an apparent stage setting process for the mid-term elections. The economy surprisingly shed 50,000 jobs lost in April, giving fuel to Cristina’s reemergence as a senatorial candidate. Jorge Correa, a director of HSBC in Argentina, was frank in his assessment that the continued presence of Fernandez in politics was holding the country back from receiving greater investment. Despite the face that grain prices are not as high as they were under Kirchner rule, one of the biggest setbacks for Macri is the continued sluggishness in corn and soybean prices. Still faced with the prospect of paying back a massive debt load from previous governments, Macri has retained a 35% tax on soybeans with the backing of farmers to keep a fiscal balance. If Brazil continues to solve logistical bottlenecks by investing in highways from inland farming areas and ports, Argentina may have to reconsider the levy, according to Louis Dreyfus CEO Gonzalo Ramirez. Therein lies the government’s other main challenge. Corporate taxes amount to about 50%, all but crippling investment for anything other than the country’s biggest exporters. Medium sized companies face considerable challenges in raising debt. The option of raising corporate dollar bonds is not an option for anything less than US$300m, and the domestic bond market has been muted since Fernandez nationalized Argentine pension funds in 2008 to make up for dwindling foreign reserves. That leaves bank credit as the only resource for SMEs. As HSBC’s Correa explained to SR after his speech, there are two main issues with that. 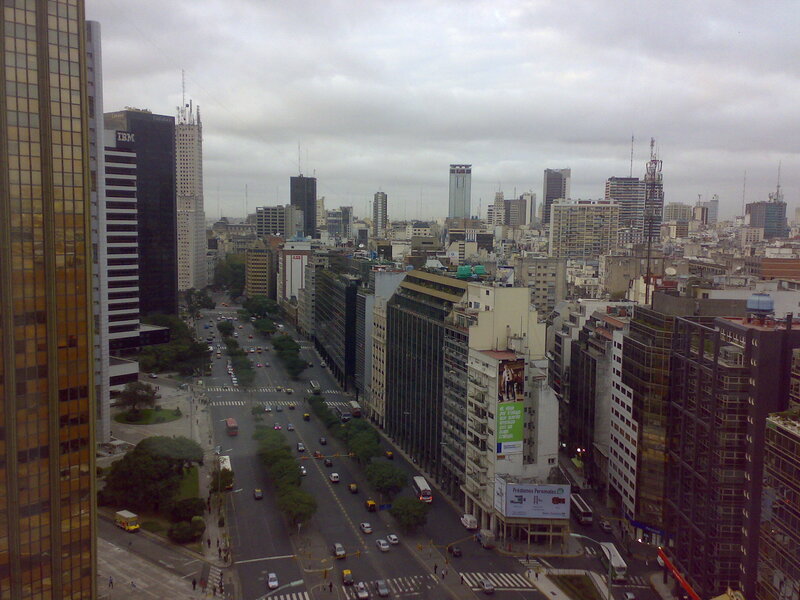 One, Argentine SMEs face a considerable tax burden and are rarely profitable. Two, the cost of initiating coverage on a new company is considerable, making the cost of that due diligence excessive in most circumstances. Before traveling, I was slightly puzzled that Argentina chose to send its transport minister Roberto Dietrich to the FT event, which listed an impressive list of CEOs including Louis Dreyfus’s global CEO Ramirez, and former Bunge CEO Raul Padilla. Dietrich, a tall, and erudite politician who looks more like soccer manager Pep Guardiola than your run-of-the-mill politician, answered a question on the mid term elections with an interesting analogy. When asked about Macri’s chances, Dietrich referred to the government’s sizeable road building program. And in particular the hundreds of kilometers of ramshackle roads in greater Buenos Aires where several million lower middle class Argentines live. Residents in this area have lived for years with roads that are unusable on rainy days, stopping their kids from going to school. If these voters can sense real change under Macri, then they might be willing to chin the subsidy removals and validate the reforms in the mid terms, he said. “There are millions of Argentines who are convinced that we are on the right path,” the minister said.